Our thanks go out to Dean of Education Jennifer Tupper for taking the lead in organization a superb Education Day! Should Davin School Change its Name? 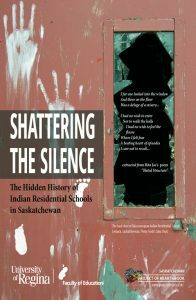 CBC Radio’s Sheila Coles interviews Dr. Marc Spooner, University of Regina, on the topic of changing the name of Davin School in Regina, due to Nicolas Flood Davin’s hidden legacy demonstrated in his derogatory comments in the Davin Report, which promoted residential schools for Indigenous children and provided the model for the Residential School System in Canada.